Aren’t babies wonderful?! They’re the embodiment of your hopes and dreams and so full of wonder and curiosity. But the explorations and investigations of young children can bring some unexpected exposures to dangers you may not see. These risks are completely avoidable in most cases. 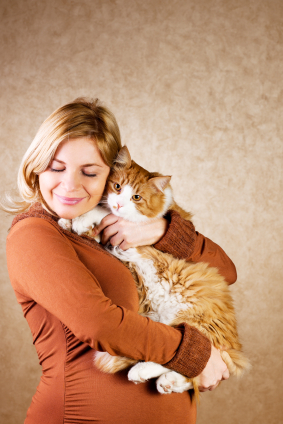 During pregnancy Toxoplasmosis presents an uncommon but serious risk to your pregnancy. Some simple steps can be taken to eliminate the risk. Be sure meats you eat are properly cooked. Do not choose this time to introduce a kitten into your home. Avoid contact with cat litter boxes if possible. Wash produce before consuming and wash your hands after working in the garden. In addition to the concerns you might have about Toxoplasmosis impacting your pregnancy, there are some parasites of animals that can directly impact young children and adults alike. You may already have a pet in your family. You may be considering adding a pet in the future … after all kids and pets just go together. But even if you choose not to have a puppy or kitten in your home, your baby will almost surely come in contact with dogs and cats. Animals add so much to life. However, there are some precautions you can take to protect your family and particularly your young children from diseases that can pass from animals to humans, including some of the easiest-to-prevent parasites. Check the list at right for 10 quick steps you can take now. Start by visiting with your physician. Your obstetrician and pediatrician can help reassure you with some common sense advice on hygiene. If you have pets, take them to your veterinarian regularly and be sure to use parasite control products available from your veterinarian. These products are convenient, safe, effective and affordable. They will keep your pet free of parasites and help protect your family from the risks of human exposure.